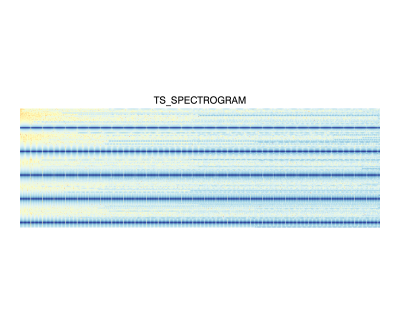 The TS_SPECTROGRAM generates a spectrogram of a given vector. This routine is written in the IDL language. Its source code can be found in the file TS_SPECTROGRAM.pro in the lib subdirectory of the IDL distribution. The result is a [WINDOW/2, 1+(X.length - WINDOW)/OVERLAP] array which describes [time, frequencies]. An n-element single- or double-precision floating-point vector. Set this keyword to force the computations to be done in double-precision arithmetic. If set to a named variable, FREQ will contain the frequency vector for the spectrogram. Set to the sample frequency of the input data. If set to a named variable, TIME will contain the time vector for the spectrogram. An integer describing the number of points of window overlap. Defaults to WINDOW/2. Note: OVERLAP is extremely data dependent. An integer giving the size of the window. Defaults to 1024. Note: WINDOW is extremely data dependent.